If you are considering moving to Hastings and would like to know more about the community we hope to provide you with some links and information about the area and what Hastings has to offer. Located in the heartland of south-central Nebraska, Hastings is the county seat of Adams County. 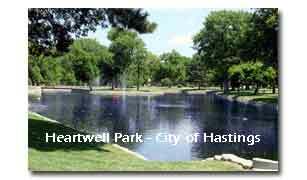 Hastings has a population of approximately 24,000 residents. Hastings is a small community with a lot to offer. Hastings Public Library offers a variety of activities and programs as well as the friendliest staff around. Hastings Museum of Natural and Cultural History, JM McDonald Planetarium and the Lied Super Screen Theatre. The museum offers a variety of exhibits from animals to historic artifacts as well as a special Kool-Aid Exhibit. The Super Screen Theatre and Planetarium offer shows each day. The Smith Softball Complex hosts local as well as national softball games and tournaments throughout the summer. The Nebraska Softball Hall of Fame is also located at the complex. The Aquacourt Family Aquatic Center is a premier water park that opened in 2004. The center features a wave pool, four water slides, lazy river, diving boards, concessions, and an interactive play area for little ones and their parents. The YMCA and YMCA-Champions is an awesome recreation facility. The two branches host events like concerts, dances, and tournaments. The facilities offer both indoor and outdoor recreation from indoor water slides, swimming pools, miniature golf, go-carts, racquet ball, basketball, and tennis courts, batting cages, a climbing maze, weight rooms, fitness machines and more. The Listening Room offers small intimate concerts throughout the year. Showcasing national as well as local artists. Annual Events that Hastings hosts include Kool-Aid Days, the Cottonwood Prairie Festival, the PRCA Oregon Trail Rodeo, the Brickyard Park free concerts and others. Other recreational opportunities include 3 golf courses, 18 parks, a skate park, 10 tennis courts, a childrens' museum, 2 theatres, shopping and restaurants. For hunters, the area provides world-class upland game bird hunting experiences. Bird watchers come from around the world for the annual migration of cranes. Hastings also hosts the Hastings Symphony Orchestra and the Hastings Community Theater for some cultural activities. Hastings Public Schools, Adams Central, Hastings Catholic Schools are all dedicated to the education of children. Hastings College is ranked among the nation's top liberal arts colleges and has some awesome sports and communications facilities. Central Community College: The Hastings Campus offers degrees, diplomas and certificates in 28 career and technical education programs, as well as academic transfer courses in 17 areas for students who plan to attend CCC for two years before transferring to a four-year college to complete a bachelor's degree. Hastings has many medical practices and specialists as well as a local hospital. Go to the Hastings Public Library web site community links. Also try the City of Hastings , the Hastings Adams County Convention and Visitor's Bureau, Adams County Nebraska, and the Hastings Chamber of Commerce.